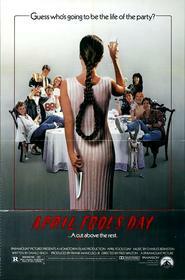 April Fool's Day is the best tongue-in-cheek slasher flick I've seen so far from the 80's and the most prescient of Scream and its offspring. Through the guise of April Fool's Day pranks, many of the conventions of horror films are explored, and because of the premise, satirized to some extent. The plot concerns a group of college kids who are heading to a rich friend's, Muffy St. John's, home for her birthday, which falls on April Fool's Day. Muffy lives on an island in the middle of a large lake, and the ferry doesn't travel there very often. This aspect of the setting suggests the secluded island in the more recent film I Still Know What You Did Last Summer, and it is used for a similar purpose. The pranks start before Muffy's friends even board the ferry. Later on we see that, since she was an April Fool's baby, Muffy is the biggest prankster of them all. On the night of their arrival at Muffy's house, the pranks start to take on a more cruel tone-but the perpetrator is uncertain. Soon, they take on the most sinister tone as they culminate in murder. In creating uncertainty about the identity of the killer, everyone is implicitly suspicious at various points in a way that suggests a possible influence on Scream. The premise is original to the best of my recollection, although I'm sure it had its own influences. Nevertheless, it is expertly realized by the filmmakers (who include Frank Mancuso, Jr. of Friday the 13th fame as producer and Fred Walton as director). I can't imagine why this film is such a sleeper-it has the same appeal as the recent teen horror flicks (and seems indubitable that it influenced some of them), and it is as good or better than most of them. Of course, if you analyze April Fool's Day as a realist work, there are some problems with the plot, but it's not meant as a realist work. It's meant as a thrilling, fantastic (as in "of the fantasy genre") horror film, and that it is. Some horror fans might be a bit offset at the non-horror payoff (there's a couple twist endings), but on the other hand, it almost forces you to reevaluate exactly what characteristics make something a horror film in the first place, and that's a valuable thing for a film to do. Recommendation: April Fool's Day is a must see for fans of the 90's teen slasher films. 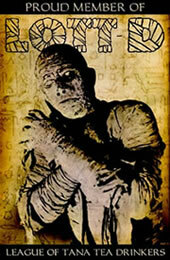 It is also recommended viewing for all fans of post 60's non-supernatural horror. Everyone else should also find things to enjoy here, as it is a quality film overall. Look for this at the video store. Produced by Frank Mancuso, who did the same duty for Friday the 13th, Parts 2-5 and 7. Submitted by Anonymous (not verified) on Sun, 2012-04-15 10:55.
" it almost forces you to reevaluate exactly what characteristics make something a horror film in the first place, and that's a valuable thing for a film to do." You are reading way too much into this dull piece of schlock. Also I fail to see how this film "pokes fun" at its genre.